For the red pepper chutney: peel the red onions, cut in half and thinly slice. Cut the red peppers in half, remove the seeds and cut into strips. Pick and chop the basil. Heat a saucepan until hot and then add a drizzle of olive oil. Add the onions, sugar and thyme to the pan and cook until the onions are translucent. Add the red peppers and paprika to the pan and season with salt. Cover and cook until the peppers are soft. Add the vinegar to the pan and allow to reduce. Set aside until ready to serve. Peel and dice the banana shallot and garlic. Bring the vegetable stock to the boil and add the saffron. Heat a large pan until hot and add a tablespoon of olive oil. Add the shallots to the pan and sweat over a medium heat until soft. Add the garlic and cook for 1 minute before adding the rice. Stir until the rice is translucent and then add the white wine to the pan. Stir continually until all of the liquid has been absorbed. Add the vegetable stock and the saffron to the rice a ladleful at a time, stirring all the time and allowing each addition of liquid to be absorbed before adding more. Continue for 15-18 minutes until the rice is cooked. Allow the risotto to rest for a couple of minutes and then stir in the butter and the parmesan. Check the seasoning. Season the lamb steak with salt and pepper. Heat a frying pan until very hot, add a splash of oil and then add the lamb to the pan. Seal on both sides and then transfer to the oven and finish cooking for 5-6 minutes. To serve: plate the risotto and top with a little of the red pepper chutney. 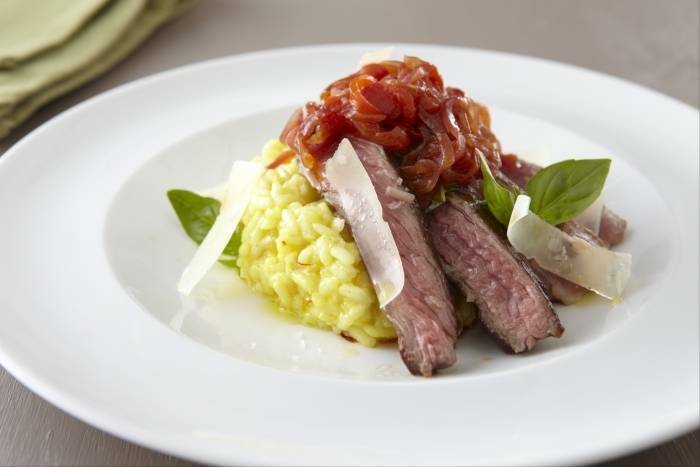 Sprinkle with freshly chopped basil and then place the lamb steak to the side of the risotto. Spoon any remaining relish on top of the lamb and finish with a drizzle of extra virgin olive oil.